The StepperIn widget works with the Arduino and Adafruit Motor/Stepper/Servo Shield v2, and listens to see if a stepper is running or not. It will output the value of the max setting if the stepper is moving, and the value of min setting if the stepper is stopped. stepper moving – This button indicates if the stepper is moving or not. Click on it to manually change the state of the widget. invert – If set, reverses the output so min is used when the motor is running, and max is output when the motor is not running. 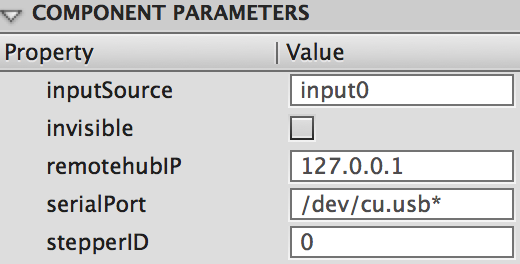 remoteHubIP – This sets the IP address of the Hub where the widget will get input values from a microcontroller. stepperID – The ID of the stepper on the Adafruit Motor Board.